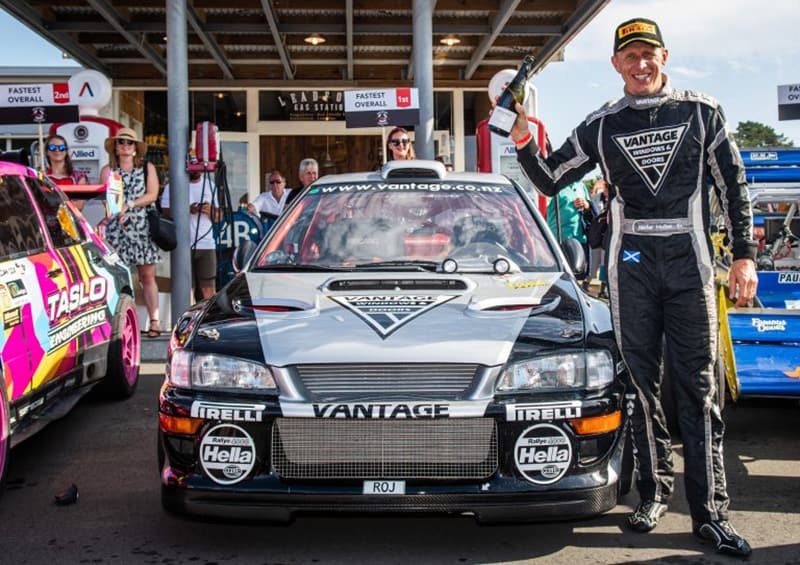 Scottish-born Alister McRae has upheld his family’s legendary driving status and made it a three-peat at the Leadfoot Festival – notching up a new record time in the mighty Vantage Subaru WRX STI. McRae had to give it absolutely everything to drop the winning time into the 47-second bracket for the first time in the Hahei-based event’s eight-year history. He even gave himself a fright as he thundered up the 1.6km driveway hill climb to clock 47.99secs. “The previous run for me I thought was almost perfect but you have always got to dig a bit deeper. I didn’t know the time when I got to the top but both my leg and my hand was shaking so that means I scared myself,” McRae says. He credited the combination of a 15-minute power-nap, a coffee and an apple, with helping him beat Rotorua’s Sloan Cox and his Mitsubishi Evo hill climb special for the third consecutive year. Event founder Rod Millen had looked on track to wrest back the trophy for his own festival, when he set the fastest time of the day yesterday. However, bogging his wickedly-powerful Pikes Peak Toyota Celica down slightly on the start-line was enough to drop him off the podium with his 50.14secs no match for United States visitor Paul Dallenbach, who was thrilled with his first top three placing in his monstrous open wheeler. For McRae there were a few tricks up his sleeve to beat his qualifying time of 48.57secs from this morning. “We turned the car up a little bit more. There was a couple of places in the previous run out of the bridge where it got a wee bit sideways on me so I just killed it a little bit on the brake there. There was quite a bit of dirt in road in through the trees and it was understeering there so I had to be a wee bit brave and keep the throttle in and throw another gear at it,” he says. For Vantage Principal Craig Vincent, who used to co-drive for the extraordinary Subaru’s previous owner the late, great Possum Bourne, it was a special moment. “It’s just awesome and so cool to go under 48seconds for the first time. I’m proud of our team of guys and proud of Alister. He’s a legend!” Mr Vincent says. Ever the gracious host, Millen was the first to congratulate his friend and rival. “We have had a great competition with Alister and his Vantage Subaru. That rivalry is what Leadfoot is all about – a chance to spend time with friends off and on the track and put on an entertainment show for all of our guests,” he says. The new SUV track saw many potential Subaru buyers out on the purpose-built off-road circuit learning first-hand just how capable the SUV models are. Mrs Stephens concludes: “Our Subaru team has loved adding to our usual set-up of displaying our All-Wheel Drive range by being able to demonstrate our XV, Forester and Outback in a unique environment.